Finding the line between vandalism and art. Why we love Quebec City: is it the cobblestone streets and old ornate buildings that make us feel like we are in Europe? Is it the sense of pride the people have of their vibrant history? Is it the beer and wine that you can buy in the corner stores? Or the cheese curds that sit in a basket on the counters? Well, it’s all of that! But what really sealed the deal for our love of Quebec City is something else. Something that may not be above but it’s at least equal to all those good things. Some may say this is silly – we were delivered a sign. Well, three signs. And the signs were music to our ears – literally! On our first day wandering around this old city, an elderly man on his four wheel scooter passed by us with tunes cranked! It rivalled the volume of a Harley Davidson. Normally, excessive noise would get a head shake and eye roll, but when it’s Led Zeppelin, there’s an exception to be made! We continued on our walk as “Ramble On” echoed down the street. Day number two of exploring the city we come across graffiti. Every city has it’s share of spray painted public spaces that spark the debate of vandalism versus art. This piece we came across had nothing artistic about it. There was nothing really thought provoking. It was simply a name sprayed in silver on a utility box attached to a lamp post. 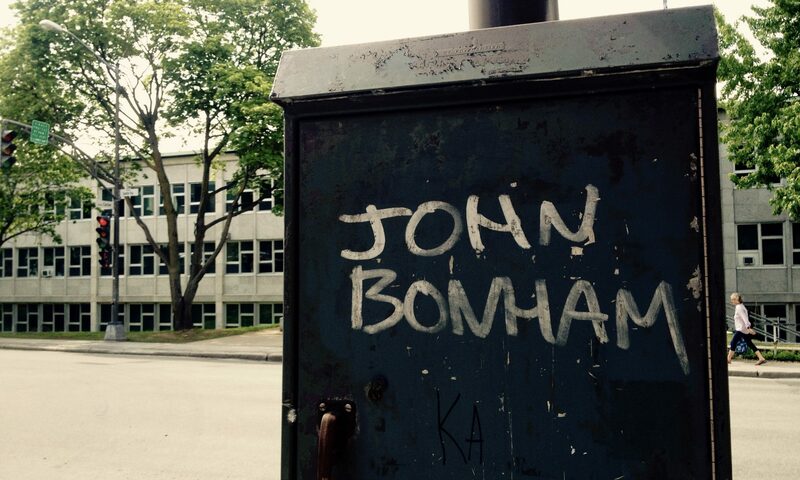 “John Bonham” is all it said. If you’re going to deface public property it might as well be with the name of one of the greatest drummers of all time. Day three. Walked into a hairdresser to get a much needed trim (gotta look pretty while on tour!) which usually means listening top 40 tunes. Not to stereotype the hair biz, but from the outside looking in there’s the usual decor and the usual scissor wielding folk – blondes with hair died black, the blue highlighted hair, Adidas or Converse or black boots, all sporting sleeve tattoos – it’s as expected as a folk duo with bearded guy playing an acoustic guitar. But right away, comes sign number 3 – “Your Time is Gonna Come” on the house speakers. Led Zeppelin is cranked in here. At that moment, it was like a slap in the face about stereotyping. It’s music that connected these moments together. If it wasn’t for the music, these would be three individual incidents that would have disappeared into the ether and never thought of again. It’s music that can connect us, break down barriers and misconceptions. Seeing a frail old man wheel by us, seeing graffiti on the street, and just walking into a hairdresser’s, all to the tune of Led Zeppelin. The old man could easily be dismissed as someone of the age that wouldn’t care about music, especially not classic rock. Yet here he was, cruising by us, “rambling on” his way, with his own soundtrack. The graffiti, probably from a young punk that doesn’t know anything about anything, with too much energy and no direction or motivation. Probably vandalizing because he needs an outlet. 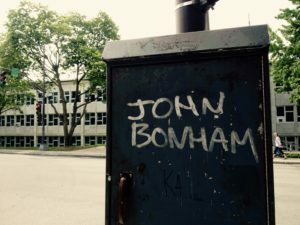 Then again, maybe he (or she) is not young and probably knows more than we give him credit for – inspired and motivated enough by Bonham to go out and paint his name for everyone to read. The hairdressers, listening to Zeppelin, well more than listening, they were swaying and moving with Zeppelin. It wasn’t just background noise or a playlist made because it’s cool/trendy to listen to. It was on because they like it. During the hair cut, through the language barrier, beneath the anything skin deep, were friendly humans. Friendly folk that dressed the way they want and listen to what they want. Farmer The Band gets to see Canada through sometimes rose coloured glasses. We see places and meet people under usually great circumstances – we are here as entertainers and “here” usually has drinks and food! But in Quebec City, we are here as short term residents – renting an apartment for a week, walking to the grocery stores, carrying our clothes to the laundromat, navigating the streets and the foreign language – we are not “here” as entertainers. We are outsiders. We are outsiders that have been warned about the snootiness of the French Canadians and their unwelcoming attitude. But the thing is, we’ve never felt like we were anything but welcome. We don’t know french. That could’ve been a problem but it wasn’t. Not even close. After clumsily saying “bonjour”, when we had the deer-in-the-headlights stare of ‘what next?’, anyone we came across, accommodated us with english. If they didn’t know english, they tried their best to help us with things like directions, or where to park and not get towed. There is nothing snooty or unwelcoming here, and that is said without the rose coloured glasses. Quebec City has showed us, that this is not a place to judge or be judged. It’s buildings, though old and some quite tired looking, have life in them. They house live music, coffee shops, artist galleries, architects, doctors, lawyers, and of course the people. They house the young people that sit in benches reading, and the old that roller blade and jog the paved path along the river. These old buildings also house and welcome visitors, like us. This city is, everyday, proving that it’s not what’s on the outside that counts. It’s like a Led Zeppelin tune that you listen to and you move with. That is why we love Quebec City.